See also 2011, 2012 and 2013, or 2015. BJF, 2016, narrator of television trailer for a proposed documentary on the death of boxing champion Freddie Mills, London: Tic Toc Films, January. BJF, 2013, Critical Focus 16: Brainstorm - New insights into Human Intelligence, The Microscope 61 (4): 169-179 (published February 2014). 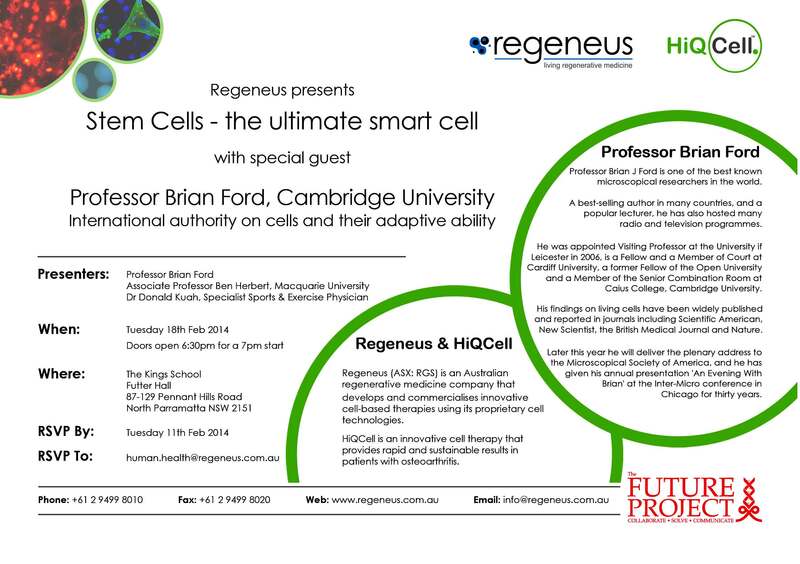 BJF, 2014, Stem Cells, the ultimate smart cell, a Regeneus lecture at Futter Hall, the King's School, Sydney, Australia: 1830h, 18 February. Today's Legacy of World War II, Illuminations Theatre, 1100-1200h, 20 February. Miraculous World down the Microscope, Illuminations Theatre, 1000-1100h, 25 February. Bringing Dinosaurs to Life, Illuminations Theatre, 1100-1200h, 26 February. Risky World of Facebook, Illuminations Theatre, 1000-1100h, 1 March. God and creation of the Big Bang. Illuminations Theatre, 1000-1100h, 5 March. Sailing: Sydney, New South Wales, Australia; Brisbane, Queensland; Pioneer Bay, Airlie Beach, Whitsunday Islands; Darwin, Northern Territories; Benoa, Bali, Indonesia; Fremantle/Perth, Western Australia, 19 February - 6 March. BJF, 2014, Reviews Spark of Life by Frances Ashcroft, The Biologist 67 (1): 35, March. BJF, 2014, Die-Hard Dinosaurs, Mensa Magazine, March: 10-14. 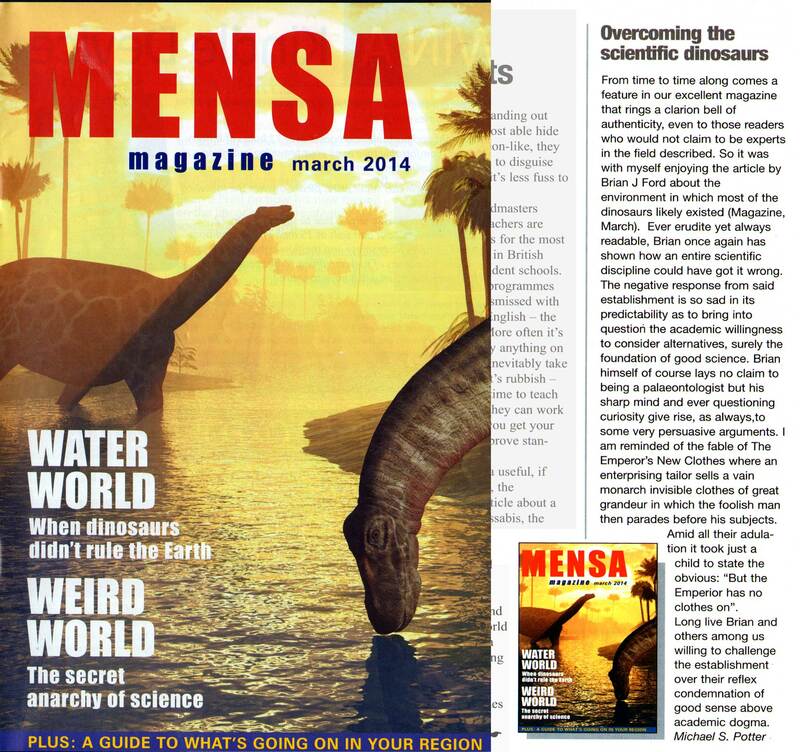 BJF, 2014, Overcoming the scientific dinosaurs, Mensa Magazine, March issue: 20-21, March. BJF, 2014, interviewed on Cardiff University chancellor controversy, Good Evening Wales, 1700-1900h, 11 April. BJF, 2014, interviewed on Griff Rhys Jones and Cardiff university,Drive Time programme, BBC Five Live, 14 April. Report, 2014, quotes Brian J Ford in Resignation call over Griff Rhys Jones 'delay', BBC News, 14 April. Evans, Gareth, 2014, Chancellor confusion 'damaging' to university, Western Mail, 15 April. Mair, Eddie, 2014, interviews Brian J Ford on Griff Rhys Jones controversy at Cardiff university, PM programme, BBC, 1710-1758h, 15 April. Matthew, David, 2014, interviews Brian J Ford in Cardiff University forced to hold fire on Griff Rhys Jones, Times Higher Education Suppkement, 17 April. Report, 2014, quotes Brian J Ford in Griff Rhys Jones withdraws from Cardiff chancellor role, BBC Wales, 23 April. Evans, Gareth, 2014, quotes Brian J Ford in Griff Rhys Jones rules himself out as chancellor of Cardiff university, Western Mail and Wales Online, 23 April. Nevgi, Kshitija, 2014, quotes Brian J Ford in Comedian's appointment as chancellor blocked by angry academics, The Tab, Cardiff, 23 April. 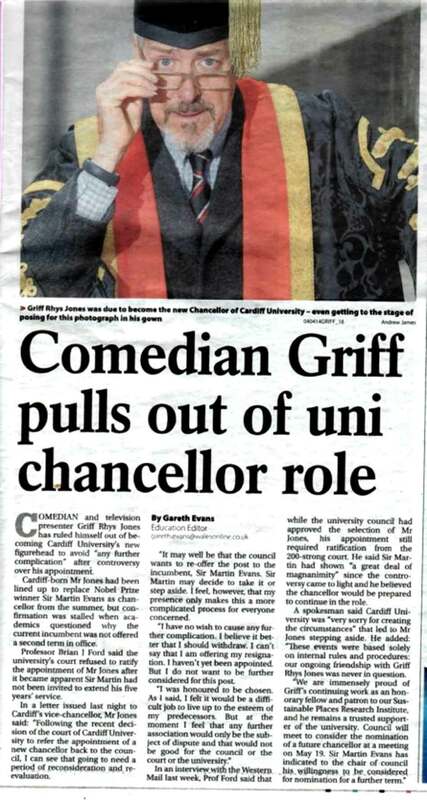 Evans, Gareth, 2014, Comedian Griff pulls out of uni chancellor role, Western Mail, 23 April. Report, 2014, quotes Brian J Ford in Rules of Engagement, Wales Eye, 24 April. Report, 2014, Griff Rhys Jones tells university to stuff their honorary job, Daily Express, 25 April. Video, 2014, extract from Brian J Ford dinosaur lecture hosted by the Frequency web site (for viewing on mobile devices), 3 May. Report, 2014, Cardiff University chancellor role to be discussed again, BBC News, 19 May. 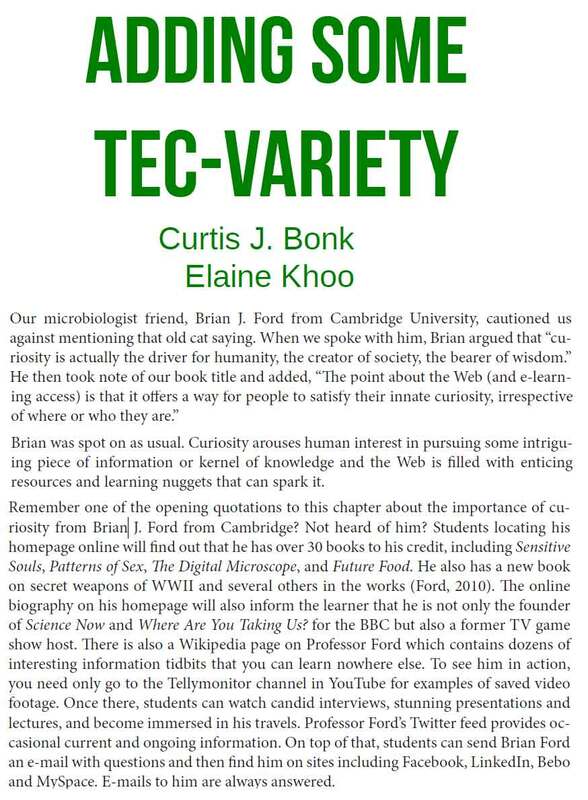 Bonk, Curt and Khoo, Elaine, 2014, discuss Brian J Ford [in] Adding Some Variety, Adding TEC Variety, CreateSpace Independent Publishing, May. BJF, 2014, Dinosaur letter, Mensa Magazine, March issue: 20-21, March. BJF, 2014, Opinion article: When the Best Microscopes create the Worst Images [see also on-line version] Microscopy Today 22 (03): 73, doi:10.1017/S1551929514000534, May. Surprising Future for the Simple Microscope, 1515-1540h, 2 June. An Evening with Brian: There is Life after Death, 1900-2000h, 2 June. Cell Intelligence through History, 0945-1010h, 3 June. Where did Iceland come from? Carousel show lounge, 1430-1530h, 12 July. Secrets of the Snowflake World, Carousel show lounge, 1430-1530h, 14 July. Prehistoric Monsters in Today’s World, Carousel show lounge, 1530-1630h, 18 July. Educating a new generation of scientists Carousel show lounge, 1530-1630h, 19 July. Also game shows: Blankety-blank, Discovery lounge: 2130-2200h, 16 July; Call My Bluff, Discovery lounge: 2130-2200h, 18 July. Sailing: Greenock, Scotland; Kollafjordur, Faroe Islands; Eskifjordur, Iceland; Akureyri, Iceland; Isafjordur, Iceland; Reykjavik, Iceland; Heimaey, Westmann Islands; Kirkwall, Orkney; Leith, Scotland. 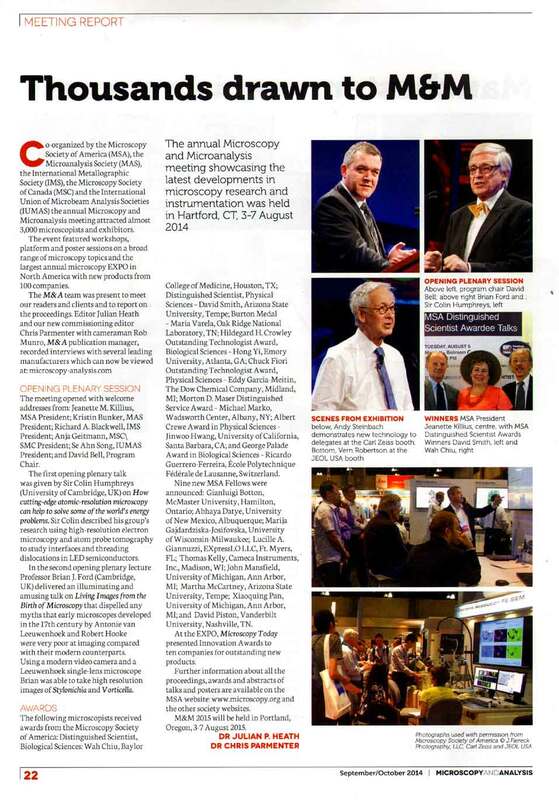 BJF, 2014, Living Images from the Birth of Microscopy, Microscopy Today [See also online journal version] 22 (04): 2-5, July issue. 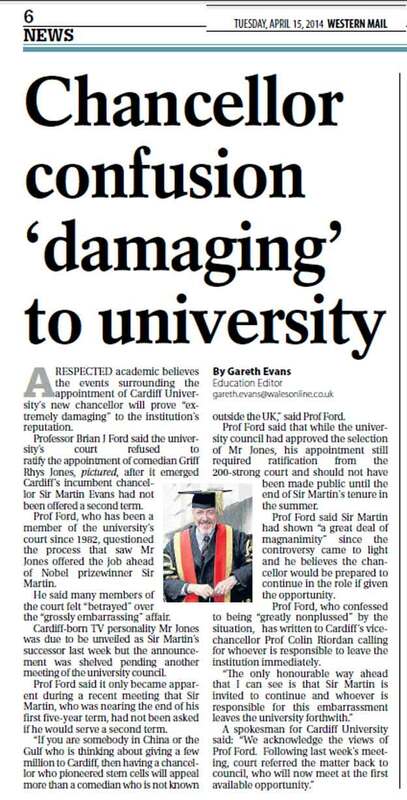 Report, 2014, Sir Martin Evans confirmed as Cardiff university chanceellor, Wales Online, 17 July. BJF, 2014, Critical Focus 17: There is Always Life after Death, The Microscope 62 (1): 15-24, 2014. (published July 2014). BJF, 2014, Living Images from the Birth of Microscopy, Plenary Address to Microscopy & Microanalysis conference, Hartford Conference Center, Connecticut, 1115-1200h, 3 August. BJF, 2014, Conference report on-line, 20 August. 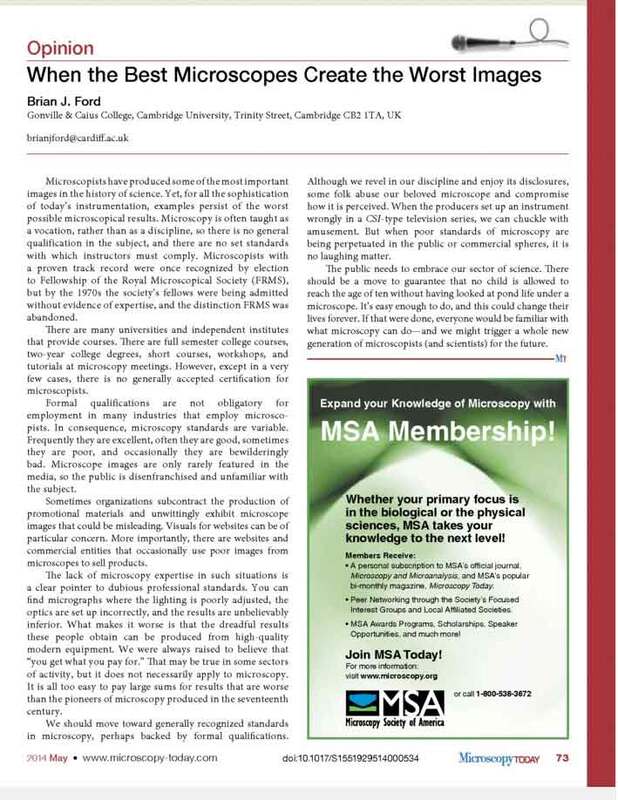 BJF, 2014, Critical Focus 18: Breaking the Myths of Microscopy, The Microscope 62 (2): 63-73, 2014. (published September 2014). 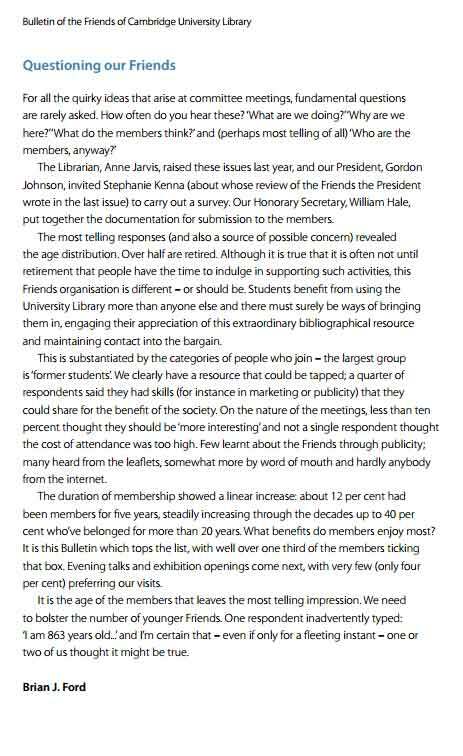 BJF, 2014, Questioning Our Friends, Bulletin of Friends of Cambridge University Library, ISSN 0265-7503, 35: 10, September. [See also: Full edition of the Bulletin]. Heath, J. P., and Parmenter, C., 2014, Thousands Drawn to M&M (with report of Brian J Ford plenary address), Microscopy and Analysis September/October issue: 22. BJF, 2014, reviews Extremes, Life, Death and the Limits of the Human Body by Kevin Fong, The Biologist: 61 (5): 33. The Science of the Aurora, Ilha Verde lounge, 1500-1550h, 7 October. Searching for the Northern Lights, Ilha Verde lounge, 1130-1220h, 8 October. Secret Wildlife that we Never See, Ilha Verde lounge, 1130-1220h, 11 October. Dinosaurs Bite the Dust, Ilha Verde lounge, 1130-1220h, 13 October. Mysteries of Ice and Snow, Ilha Verde lounge, 1130-1220h, 16 October. With HIV and now Ebola, will humans be eradicated? Ilha Verde lounge, 1400-1550h, 18 October. Ilha Verde lounge, 1130-1215h, 20 October. Ilha Verde lounge, 1415-1500h, 21 October. Sailing: Avonmouth, Bristol, England; Stavanger, Norway; Ålesund, Norway; Svartisen Glacier, Norway; Narvik, Norway; Alta, Norway; Honningsvåg, Norway; Tromsø, Norway; Åndalsnes, Norway; Bergen, Norway, Liverpool, England. 6-22 October. Sheila B, 2014, cites Brian J Ford on spontaneous human combustion [in] Something Spontaneous, All Things Dickens: 6 November. Rogers, Tim, 2014, Asking Awkward Questions, article on Week In Week Out with photograph from 1965, BBC Blog, 245 November. Secret Legacy of World War II, Illuminations Lecture Theatre, 1100h, 1 December. Shocking Secrets of Facebook, Illuminations Lecture Theatre, 1530h, 3 December. Miracles of the Living World we Rarely See, Illuminations Theatre, 1000h, 10 December. Bringing Dinosaurs to Life, Illuminations Lecture Theatre, 1530h, 11 December. Also on morning television show, 11 December. Sailing: Southampton, England; Funchal, Madeira, Portugal; Las Palmas de Gran Canaria, Spain; Santa Cruz, La Palma, Canary Islands; Arrecife, Lanzarote, Canary Islands; Lisbon, Portugal; Southampton, England. 30 November – 12 December. BJF, 2014, Critical Focus 19: Crisis Point – the rise and fall of penicillin, The Microscope 62 (3): 123-135, (published December 2014). BJF, 2014, review of Marc J. Kuchner, Marketing for Scientists, 236 pp paperback, ISBN: 1-59726-994-8, Washington: Island Press [in] The Biologist. BJF, 2014, review of Frances Ashcroft, The Spark of Life, ISBN 978-1-840-14301-4, 339 pp, London: Allen Lane [in] The Biologist. BJF, 2015, Meat - the Story of our Greatest Addiction, Oxford: One World Books. Return to previous year 2013, or next year 2015.